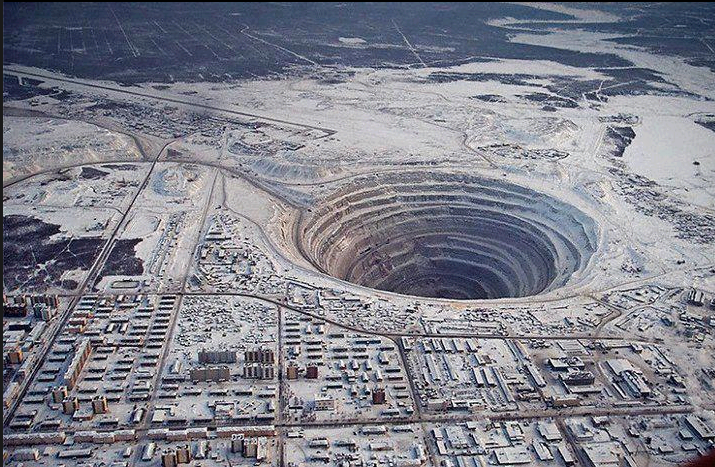 Russian miners at the Alrosa’s Udachnaya diamond mine unearthed a 30mm rock that has been found to contain about 30,000 diamonds – a concentration that is 1m times higher than the conventional rock containing diamonds. The miners immediately knew the stone was different from what they were used to digging out, because it was largely red and green in color. They were used to extracting thousands of ore per day, and processing them yielded the desired precious stones which are then marketed to international customers. The mining company did not keep back the precious stone even though it was theirs by right; they donated it to the Russian Academy of Sciences who scanned the rock with x-rays to reveal that the diamonds are so small they can barely be used for gems. The red and green color was produced by larger crystals of olivine, pyroxene, and garnet; and the diamonds are octahedral in shape and measure 1mm, which is almost like two pyramids stuck together at the base. “The exciting thing for me is there are 30,000 itty-bitty, perfect octahedrons, and not one big diamond,” said Larry Taylor, a geologist at the University of Tennessee. “It’s like they formed instantaneously. This rock is a strange one indeed.” Taylor presented the findings at the American Geophysical Union’s meeting that holds annually. Scientists are aware that diamonds are crystals of pure carbon forming under extreme pressures and intense heat formed in the Earth’s mantle – the layer under the crust or surface layer of the earth, at a depth of nearly 150 km. But then, scientists are still baffled about what processes actually take place to produce diamonds. “The (chemical) reactions in which diamonds occur still remain an enigma,” Taylor had said. Russia is the world’s largest diamond-producing country, and makes over $4 billion revenues from diamond sales every year, while about $2.5 billion of this is made from India-funded clients. Alrosa is state-controlled to mine for diamond, and it accounts for 99pc of Russia’s output and 27pc of global diamond production.